For each of the past few seasons, California’s Great America has introduced a major new attraction. In 2016, the park took guests into space with Mass Effect: New Earth, and later that year, introduced WinterFest, adding millions of Christmas lights. In 2017, Great America’s Vortex coaster got a floorless remake and transformed into Patriot. Yet, those additions pale to what the park has in store for this year. 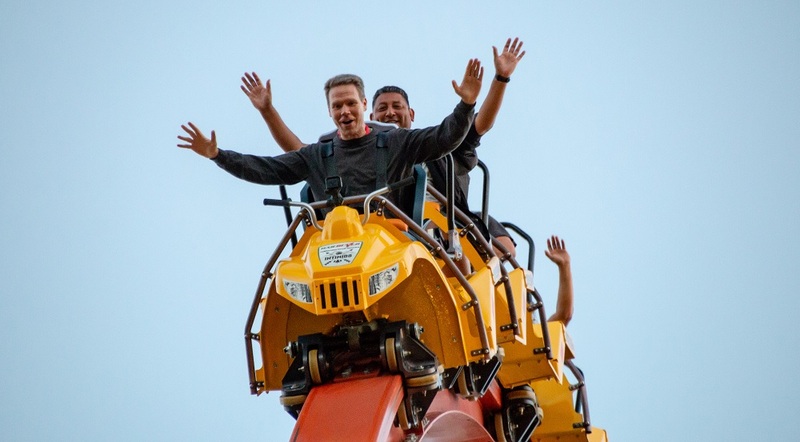 “I will tell you what, in my opinion, none of those are in comparison to what we are introducing today: RailBlazer,” said Raul Rehnborg, vice president and general manager of California’s Great America, told a crowd gathered during the ride’s opening ceremony on June 14. About 10 months after the shovels hit the dirt marking the beginning of construction, RailBlazer is now open and thrilling riders with its unique design and unbelievably-fast twists and turns, and Great America invited ACE to the media day to be some of the first riders. Manufactured by Rocky Mountain Construction, RailBlazer is a prototype coaster based on RMC’s new “Raptor” model. Eight riders traverse in a single file train on a single rail, giving them a unique perspective as they plunge down a 90-degree first drop. After a 45-degree lift hill that reaches a height of 106 feet, RailBlazer travels at a top speed of 52 mph, with an abundance of airtime, three inversions and a zero gravity roll. It celebrates the Bay Area and Central Coast’s scenery that is connected by State Route 1, or SR1, which was the ride’s codename in the months before it was announced. Rob Decker, senior vice president of planning and design at Cedar Fair, said he never worked on a project quite like RailBlazer in his 19 years with the company.